A group of patriots wearing Native American costumes boarded three ships that were docked in Boston Harbor on the evening of December 16, 1773. As a symbol of political protest, they proceeded to throw 340 tea chests overboard. This action by the Sons of Liberty was a demonstration against the Tea Act. These American patriots engaged in one of the defining events that led to the American Revolution. You can experience this momentous occasion when you use a discount coupon code to visit the Boston Tea Party Ships and Museum. Purchase your tickets online and save! Use promo code BNTP1OFF to receive an additional discount on the price of admission. 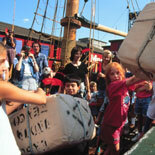 Created to educate visitors about this historic moment, the Boston Tea Party Ships and Museum takes you back in time. Meticulously recreated replicas of the tea ships, a multi-media documentary, state-of-the-art interactive displays and costumed re-enactors enable visitors to relive the actions on that fateful night of colonial defiance. Explore the museum which contains one of the actual tea chests thrown into Boston Harbor. Afterward, climb aboard one of the vessels and perform your own act of defiance.